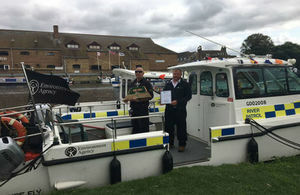 The IWA has presented an award to recognise the Environment Agency's hard work on Anglian waterways this summer. A prestigious 55-year-old trophy has been presented to Environment Agency staff as thanks for their hard work in helping boaters make the most of Anglian waterways this summer. The Inland Waterways Association (IWA) made the gesture at their Festival of Water at St Neots as the Environment Agency welcomed hundreds of boats and thousands of visitors to the River Great Ouse over the bank holiday weekend. Since 1963, the Best Working Boat award has been presented to working vessels, and this year it went to two EA boats – the Ouse II Know and Ouseabout. We’re delighted with this recognition of our teams’ hard work to maintain our waterways for people and wildlife. This summer, the hot, dry weather presented some challenges like weed growth, fallen trees and lower levels on some of our navigations, so we’re extremely pleased to have made a contribution to a very successful festival. We’ve had so many great comments from visitors about the Great Ouse and the River Nene – it’s given us a real boost to help people enjoy them while getting closer to nature. The IWA award recognises the efforts of the team over many months to make sure boaters had smooth sailing on the region’s waterways. Just days before the event, for example, it was all hands on deck to make sure a broken lock didn’t hamper visitors reaching the festivities. Hemingford Lock on the River Great Ouse suffered a mechanical failure – the drive shaft had separated, meaning the lock couldn’t be operated even by hand. Getting the lock up and running again as soon as possible became a priority, and the team dropped everything to repair it in under 48 hours. And over the previous months, EA teams really pushed the boat out to make sure Anglian waterways were in tip-top condition for both local boaters and visitors to enjoy. This included refurbishing 8 of the region’s busiest locks used by around 7,000 boaters every year, revamping 10 landings, clearing a number of large fallen trees, de-shoaling on the rivers Great Ouse and Nene, and spending an extra £60k on de-silting the tidal Great Ouse at Denver, Salters Lode and the Old Bedford on top of the regular annual de-silting and weed-clearance. To make it easier for boats to navigate, teams also made half a dozen passes to clear duckweed from the Old West channel – work that must be done carefully in hot summer conditions to avoid having a negative impact on the environment and wildlife. The work is part of the Environment Agency’s £2.5m investment in the 353 miles of navigable Anglian waterways, protecting them for the future as an important part of the nation’s rich heritage and beauty, and recognising all they contribute to our environment, health and wellbeing and economy. The festival also saw the IWA, Lincolnshire County Council and the Environment Agency launch a new initiative – the Boston to Peterborough Wetland Corridor, which will see all three organisations working in partnership to progress a wetland corridor from the Black Sluice at Boston to the River Nene near Peterborough. The proposal would bring a huge boost to Anglian waterways with new recreational access for boaters, cyclists, fishermen and walkers, a significant section of wetland habitat for flora and fauna, and economic opportunities for local communities – especially in connection with the proposed Bedford to Milton Keynes waterway park, a new 16 mile link from the Grand Union Canal in Milton Keynes to the River Great Ouse in Bedford. You can find more information on Anglian Waterways here.